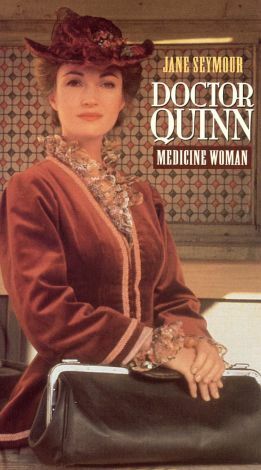 One of CBS' most popular weekly series of the early '90s, Doctor Quinn, Medicine Woman began life as a two-hour TV movie. Jane Seymour stars as Dr. Michaela "Mike" Quinn, who in the mid-1860s sets up practice in a small Colorado Territory community. Not unexpectedly, there are several hard-bitten locals who don't cotton to havin' a lady sawbones in town. Still, before the film is over, it is clear that Dr. Quinn is there to stay--and nobody is happier than the "disenfranchised"--the very old, the very young, the blacks, the Indians--whom she quickly befriends. Though set in the 19th century, a strong current of 1990s Political Correctness flows through this easy-to-take production. Upon Dr. Quinn, Medicine Woman's first telecast on January 1, 1993, the TV Guide critic predicted that "Given half a chance, she may just succeed."